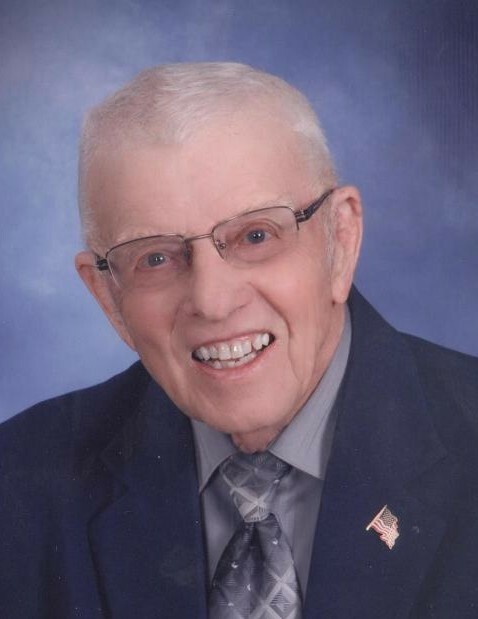 Raymond M. Bergeson, age 95 resident of Ortonville, died March 30, 2018.. Funeral services will be held on Friday, April 6, at 11:00 a.m. at First English Lutheran Church in Ortonville. Pastor David Tonn will officiate and burial will be in Mound Cemetery. Visitation will be held on Friday, one hour prior to the service at the church. Raymond Merlin Bergeson was born to Bernard H. and Cora (Gilbertson) Bergeson on August 13, 1922, at home in Dawson, MN. He was baptized and confirmed at Riverside Lutheran Church in Dawson. Ray graduated from Dawson High School in 1940. Ray served in the U.S. Army Air Corps as a crew chief and was in counter intelligence from 1943 to 1946. Ray worked at Douglas Aircraft in Venice, CA, managed IGA and Super Valu Grocery Stores. While managing Super Valu in Redwood Falls, MN, he met Lois Ann Meyer. They were married on May 31, 1953. To this union three sons were born. Ray was in the insurance and banking business most of his working years and owned a credit bureau for a short period. He was employed by Norwest Bank in Ortonville for 20 years. Ray and Lois lived in Redwood Falls, MN, Dawson, MN, Blue Earth, MN, Paynesville, MN, and Ortonville, MN. He was a member of First English Lutheran Church. He was an officer, Sunday School teacher, usher, and youth adviser. In the community, he started the Saturday Quarterback Club, served on the OAHS board of directors, coached many ball teams, and served on many committees. After retirement, Ray and Lois volunteered as campground hosts at Carlos State Park for eleven years. They also traveled extensively. Ray enjoyed woodworking, sports, fishing, and camping. In 2016, Ray and Lois moved to Fairway View Catered Living. In April 2017, Ray entered Fairway View Neighborhoods. He is survived by his wife, Lois; children: Steven (Kim) Bergeson of Fargo, ND; Mark (Sandra) Bergeson of Canton, MI; Michael (Aimee) Bergeson of Kennewick, WA; grandchildren: Brian (Holly) Bergeson, Marissa (Mark) Morton, Nathan Bergeson, McKenzie Bergeson; step-grandchildren: Nathan (Abby) Bauer, Jacob (Mary) Bauer, Ethan (Diana) Bauer, Hayli Bauer, and six great-grandchildren. He was preceded in death by his parents; siblings: Gordon Bergeson, Evelyn Dahl; sister in law, Bethel Anderson; brothers in law: Glenn Dahl, William Meyer; and nephew David Meyer.